This is a hardcopy of the Droids Jann Tosh coin. It was made by applying separate layers of epoxy and Dynacast directly to the surface of the original sculpting of the coin. As you can probably tell, this hardcopy is substantially larger than the production coins. 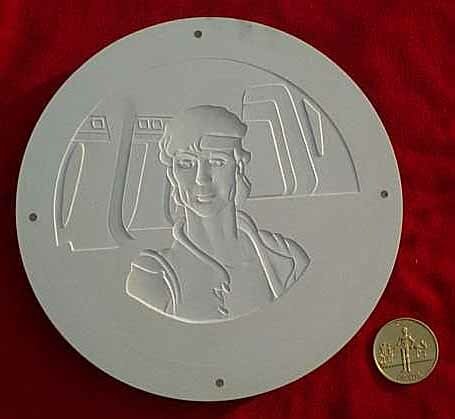 This is because the Kenner coins were sculpted at approximately 6 times the size at which they were eventually produced, in order to allow the sculptor some leeway in detailing his work. Although you can't really tell it from the image, the hardcopy has negative detail, meaning that the character images are incised into the surface rather than raised above it. This is because the sculptings were done as positives. Since the hardcopies were simply casts made off the sculptings, all of them have negative detail. These "stage 1" hardcopies were used in the creation of flexible softcopies, which were produced by simply pouring silicon over the surface of the hardcopy, allowing it to cure and pulling it off. Consequently, the softcopies have reversed detail in comparison with the hardcopies and their detail is positive. The softcopy companion to this piece can be seen here.